Posted by Jellio on November 15, 2005. It's the last-minute, edge-of-your-seat plays like this that make football so great, and it's in honor of these, that I thought I'd take a look at some of the wilder plays in the history of the NFL. Now please note, I didn't go for the usual ones, so you won't find The Catch (Joe Montana to Dwight Clark), or The Drive (John ELway 98 yard march to an overtime victory), or even the Immaculate Reception (The Franco Harris "look what I found" play). I wanted to focus on some of the stranger plays I've seen. And as always, feel free to call me slanderous names and tell me the ones you think I missed. I'll bet no one that reads this blog has even heard of this 1979 Seahawks/Falcons game. But I mention it on this list for two reasons. One, this was the first time the lowely Seahawks graced the Monday night stage, and two, Effren Herrera was the Dallas kicker for years, and I've already mentioned my feelings on Dallas. This is the one play that's before my time, but I've read about it many times, and it's too great not to mention. 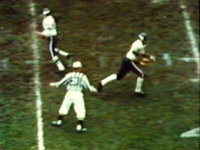 October 25th, 1964, Vikings-Niners. Vikings defensive end Jim Marshall picks up a fumble but accidently runs 62 yards the wrong way, scoring a safety for the 49ers before he realizes his mistake. How messed up, hung-over, or whatever do you have to be to run 62 yards in the wrong direction...awesome. Number seven isn't a play, but the whole Bill-Oilers Wild Card game of 1993. I include it here because I LOST FIVE HUNDRED FREAKIN' DOLLARS ON THAT GAME. Technical name - The hook and lateral...the receiver runs a 10 yard route and turns in (hook), then passes back to a teammate running at full speed (lateral)...but hook and ladder sounds cooler. The best example of which will always be from the Miami/San Diego playoff game of 1981, with Don Strock passing to Duriel Harris, who pitched it back to a sprinting Tony Nathan who ran 40 yards for the score. The game set playoff records for the most points scored in a playoff game (79), the most total yards by both teams (1,036), and most passing yards by both teams (809). Chargers placekicker Rolf Benirschke kicked the winning field goal in overtime for a 41-38 San Diego win. 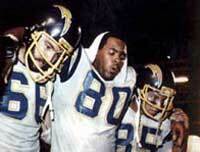 The image is of Kellen Winslow being helped off the field after a very emotionally and physically draining game...wuss. (Military reference...get it?) Super Bowl 34. Trailing 23-16 with 10 seconds remaining in the game, the Titans have one final shot to tie the Rams. Steve McNair passes to Kevin Dyson who is tackled AT THE ONE YARD LINE. No time left...Game over...Rams win. I include this play because it was the sickest ending to a Super Bowl I've ever seen, and I happened to be in Hawaii at the time, pretty much totally shitfaced by 2:00 in the afternoon. You knew I was gonna have a Cowboys player on this list, and Mr. Lett makes the cut with two classic blunders from 1993. 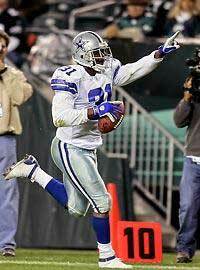 In Super Bowl 27, the Cowboys had a 52-17 lead late in the fourth quarter, Leon picked up a Bills fumble and runs for a 64-yard touchdown. 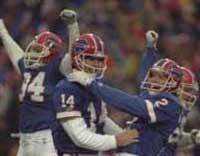 Wait, Leon starts his victory stroll at the five, and Bills receiver Don Beebe knocks the ball out of bounds for a touchback. I remember thinking that touchdown would have covered what was a huge spread, and Leon must have had Buffalo and the points....sleep well, Leon. That wasn't the end of the Leon fun in '93. Thanksgiving Day, Dolphins kicker Pete Stoyanovich attempts a 41-yard game winning field goal with seconds left. The kick is blocked. (Cowboys win, right?) Wait, the ball spins toward the end zone. All players avoid the ball, but sure-footed Leon jumps on it and slips on the snow, making it a live ball. The Dolphins recover at the two...Stoyanovich kicks a 20-yard field goal...time expires...Miami wins. I throw a bowl of stuffing across the kitchen. Leading 17-12 with less than 20 seconds left in the game, the Giants lead 17-12. 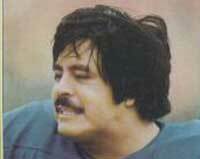 Quarterback Joe Pisarcik will obviously just take a knee...wait...what's going on...Pisarcik hands off to running back Larry Csonka...Csonka fumbles and Herman Edwards picks up the loose ball and runs it in...EAGLES WIN. This was great on so many levels...1) I hate the Giants 2) I love it when Giant's fans are in pain and 3) these days, Herm Edwards is pretty much my favorite coach. All good reasons to make this my favorite wild play. THAT'S ALL. BUT IF YOU LIKED THIS, YOU'LL LOVE THESE! Another one - 1980 Packers/Bears season opener. In OT, Chester Marcol, a curly haired glasses wearing kicker from Poland, lines up for a winning field goal. It's blocked, right back to him, and he runs for the winning touchdown, carrying the ball like it's a puppy trying to squirm away from him. Great list. 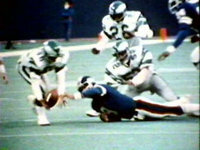 I need to find a video clip of the 1979 Seahawks-Falcons game. I'm surprised you missed the 1995 Morris Knolls-Livingston High thriller. Livingston had the ball, leading 12-8 in a driving rain with :09 to play. It was 4th down, so their coach could have 1) Had the punter run backwards and take a safety; 2) Had the punter run around for :09 and fall; or 3) Had him shank a 12-yard punt out of bounds, leaving :03 to play. Because that '95 Morris Knolls team had fate on its side, of course it was #3. Our backup QB (the starting QB had been suspended for dipping in a team meeting the night before) launched a 45-yard bomb towards the end zone, which was tipped and caught by wide receiver (and current assistant coach) Kevin Borecki, who fell into the end zone for the game-winning touchdown. Also his first career catch. Two months later, we (Knolls) went on to win the second (of three) straight state sectional title. Shocked this wasn't on your list. Anyone else want to post his or her high school sports memories, go for it. Make me feel a little less pathetic. a dolphins field goal attempt. There's a couple of follow-ups to the Herrera story, IIRC. A few games later, they tried the same play, but Zorn got pressured and Herrera couldn't catch the pass. Then a few games after that, they went for it one more time... This time Zorn tucked the ball and scrambled for a first down. After the game, a reporter asked Herrera why Zorn didn't throw the pass to him. "I was double-covered," replied Herrera... probably making him the least athletic receiver to ever to be double-covered in an NFL game. If my memory serves me correctly, I believe Herrera almost got in the end zone on one of the trick plays. I can still see him reaching out for the pylon. I was a huge Seahawks (Jim Zorn) fan as a kid and this was the first time they were on MNF. Funny how I can remeber crap like this, but can't tell you where my spare house key is. That was one great play. I'm a little late on the comments.. But I remember that efren herrera play.. I watched it on my little 12 inch tv in my room. And I don't think anyone else could have described it better.. Except that after he caught it you didn't mention how he laid on the ground cradling that puppy like it was gold. One of my favorite plays of all time. I'm die hard Hawks fan and that stands out just as much as Largent's hit on the Bronco's DB in '88 after the interception.. woo dang! # 10, the Herrera catch on MNF. Somebody else saw it... I watched that game with my dad when I was 11 years old. I don't remember much from when I was under 20 years old, but that is one memory I'll never forget! It was cool to watch! Posted by Seattle #12, Sara. #10, the Herrera catch on MNF. Someone else saw it... I watched this game with my dad when I was 11 years old. I don't rmrmber much from before the age of 20 or so, but I remember this play. It was cool to watch. never has anything been done like what franco harris did to catch the ball and run for a 60 yard touchdown with only 22 seconds remaining on 4th down to win the game against Oakland to get the super bowl. In my and many other peoples eyes that play should not only be on this list but should be #1. The "Immaculate Reception" did not vault the '72 Steelers into the Super Bowl. It vaulted them into the AFC Championship Game against the undefeated Dolphins. Miami won the game in Pittsburgh and went on to beat the Redskins in Super Bowl VII. Loved the reference by DRRINO to that hit by Largent on the Denver DB. I thought I was the only one that remembered that. Probably the hardest hit I've ever seen. Why didn't you include Garo Yepremian's fourth-quarter QB duties in that SuperBowl against the Redskins?